Before I learned how to organize my spring cleaning, I did a lot of work and nothing seemed to actually get done. On more than one occasion, I found myself sitting in the middle of a room surveying the mess I created while trying to clean an already messy room. I would choose a target - usually the closet - and get to work. By work I mean remove everything from the closet, place them on the bed and bedroom floor then stop - look around - feeling tired and frustrated I then put most of the stuff back. What would not fit or what I considered throwing away would then reside in a pile in a designated corner of the room for weeks. If so, it's time to turn a new leaf and start organizing your house cleaning. I've learned how to avoid this energy wasting experience described above and since it's spring cleaning time again I'm going to share with you - my guide on how to organize spring cleaning. We will start with what not to do, then look at what you should do, and finally get some spring inspiration from Jean X (winner of a housecleaning-tips.com cleaning contest). In her Jean shares every step of her cleaning process. Spring Cleaning Don'ts: Five things you should not do when spring cleaning your home. Don't start without a plan. On the day you decide to do some cleaning, you should wake up knowing exactly what you're going to do. You should have a list of the cleaning tasks you plan to complete, the time you think each task will take, and an idea of success. In other words, if you have two hours to devote to spring cleaning a space today, the tasks on your cleaning checklist should go beyond your designated two hours. Also important is knowing your idea of success: once you complete your cleaning tasks, what do you expect the space to look like when you're done. Achieving your idea of success motivates you to move forward know that there is a light at the end of the tunnel. Get help. If you don't live by yourself don't do it all by yourself. You might think that it is easier to get things done when no one else is in the way, especially if they don't do the cleaning as well as you like. This may be true, however, if you had help in creating a mess and you cleaned up all by yourself - maintaining the newly cleaned space will be difficult. This is because no one else will appreciate the effort it took to get to that point. They won't feel the need to defend the space from returning to its former state. They won't feel the need to avoid - as long as possible - having to go through the cleaning process again all to soon. This is what you want, a household of people defending their home against clutter, dirt, and disorganization. Don't let others use your home as a storage facility - not even you. If the kids have grownup and moved out or other former household guest, especially if they have homes of their own - call them for their stuff. In the case of kids these could be their childhood treasures which you or they could not get rid off. Reclaim your space! Don't think you can spring clean the entire house in one weekend. A very bad idea would be to turn over the entire house in a race to finish your spring cleaning by Sunday night after starting on Saturday morning. First of all, if you don't finish this will add to your frustration especially now since you have to live with it until you find more time to continue your cleaning. When cleaning one mess don't make another one elsewhere. Very important. Remember my run-in with the closet. Be sure that when you're cleaning one space that you are not just moving stuff from one room to another. In the end, this will be like cleaning up the same mess over and over again. Big time waster! Spring Cleaning Dos: Five things to do when spring cleaning. Plan your work - then take action. Survey your home and decide which rooms and/or spaces you want to spring clean. Take pictures of there current state (before pictures). Now have a clear picture in your mind about how you want the room to look when you're done (after pictures), you can even go as far as writing down a description (your idea of success). Next, in between your before pictures and your ideas of success, write down all the tasks that need to be completed in order to get from before to after. Make a cleaning schedule. With your list of cleaning tasks in hand schedule when they are going to be done and by who. Also, if some unexpected event happens and a task cannot be done at the appointed day and time - be sure to reschedule the task. 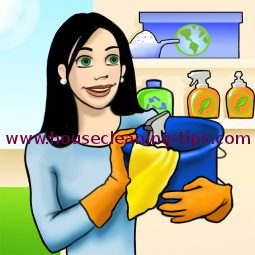 Finally, you can go to the house cleaning schedule page for an example of a personal house cleaning schedule. Have everything you need at hand. Once you get started with your cleaning tasks - you will want to avoid having to stop in order to room to the other room to get cleaning supplies or anything else you may need to get the job done. So, when you make your plan, be sure to list everything you need to accomplish your tasks (spring cleaning checklists, cleaning supplies, music etc.). 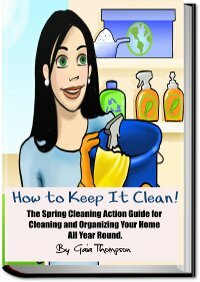 Make your spring cleaning fun Cleaning is work and can be boring. To help with this you can try music or organize a family spring cleaning day and have "best clean" competitions. Have a maintenance plan. This plan comes into action once the after pictures in your mind are realized. This involves making a regular cleaning schedule for the room. First decide on the cleaning tasks that will be necessary in order to maintain the room in its after state for as long as possible. Then decide on how regularly you will do these tasks - some might be daily, weekly or even on a monthly basis. This is my dining room table. As you can see I am in a different category than everyone else. I have OCD in other words I am a hoarder of anything and everything. I have been studying up to try to see how I can solve my problem and realize that all things are not needed in my life. My home, My life, My self esteem, has all been wasted all this time. 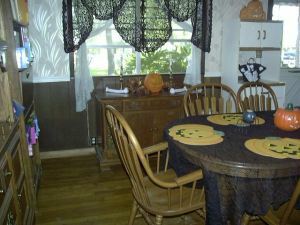 I have missed many years of my grandchildren, and children not coming over for there was no where to sit. It is very hard to do this sifting through things by myself. I have wanted my table clear for two years now. I still think I can do it this weekend and I will try because it would be so nice to have a table to do my payroll on, eat on, to drink coffee with my husband on, do taxes on. I have been on this project for two weeks now. And I am so happy that me and my husband drank coffee this morning for the first time in two years at my dining room table. I feel like 100 pounds got lifted off me. It seems so airy and I can collect my thoughts much better. I love it, I want to stay in this room all the time now. 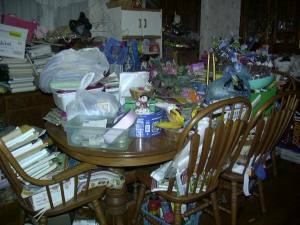 When I started I looked at the mess and took Bette's advice and started small because it was too overwhelming. First I cleaned my floor so I could get around the table. Then I started with the first china cabinet and cleared all the video tapes off, papers, knick knacks, school books, file folders etc. Then I used lemon oil and wiped the entire cabinet down and swept a small area in front. Then I removed the three boxes that were in front of the door so we could open the door. Wiped down the door with soapy water, cleaned the glass in side of it and cleaned the door window with Windex. Then removed all the clutter in front of the cabinet which were 5 crate boxes of schooling items. Went through all these boxes and found a better home for them. Next I began chair 1 in the back removed all the paperwork from one and had to go through it. I threw away a bag of unnecessary paperwork.YEH! Then chair 2 took the school books out of it and went through them and boxed them up because they aren't used as often. Chair 3 had notebooks and books and laminating paper, I looked through notebooks and went through books and removed all of it and put it up. Chair 4 school books - looked through them and removed and boxed up half of them. Chair 5 had miscellaneous junk - went through it and threw it out. YEH! Cleared the gifts off of it from xmas, swept under it and got 3 of Neko's play balls that she never could get to once it rolled under the furniture. I took the boxes and the books and the crates off and went through them. Took wire shelf extenders and put in the garage - I had 10 of them in the corner area. Cleaned with wet washcloth and then used lemon oil on it. Cleaned window sill with soapy water cloth and watched Neko (my cat) jump on the window sill all happy. My schooling shelf I cannot touch because it will be going into a room in the back with my computer and other schooling items. However I was able to get things cleared enough on it to close the little door on it and dust the shelves. Now it was time to clear the table. I put things up, went through all storage boxes, and went through all books and videos. Went through all the bags and threw away alot of it. YEH! I put the crate up in a cabinet in the kitchen,.and threw away the items in the cooking dish next to it. YEH! Now my corner by the school books shelf - I went through the items and unfortunately some had to go back, three items that are gifts for this xmas and we are afraid of loosing them before we can wrap them. SORRY! But did clear out the items and all the paints and paper went into the utility room. The rest went to garbage YEH! Next, I cleared and went through the crates that were in front on the floor of the 2nd china cabinet. I put the storage containers away and placed everything else where it needed to go. Now I have enough of my floor clear to sweep some more of it. Next, I took the school books off of the cabinet went through them and put them on the shelf. Brought my papers after going through them into my front room to go to work with me. Many other mic. items were stored on there too. Now I am able to polish this cabinet only with wood cleaner. Now I can finish sweeping my whole floor. WHEW! I can also clean my windows and get the cob webs out of the window frames. I mop and then mop over with a mop and glow. I even cleaned and polished my chandelier over my table and cleaned the fan. This is scary because now my room sounds like it echoes.OH MY GOD AFTER TWO+ YEARS I FINALLY HAVE A DINING ROOM. 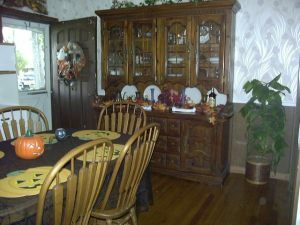 Now it is time to do what I used to do best and that is decorate for the holiday so I put my fall leaves on the china cabinet and added my bones. Put my Halloween wreath on my door hung outside my H. wind sock, and put my H. mat at the front door. Put my pumpkins and my napkins/bones in a H. basket on my white cabinet. Then put my Jack O Lantern on my furniture under my front window and added my fall leaves and two ghost candles and bones that glow in the dark. 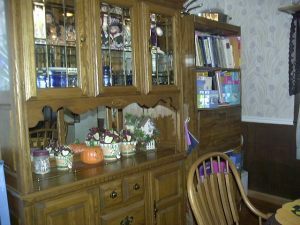 Then on my other china cabinet I added a pumpkin too. 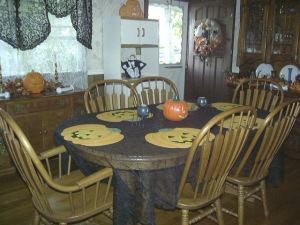 Then for my table I put a spider web table cloth on it and added a Jack O Lantern and two spider candles. I am POOPED but so well worth this especially for me. This project has really opened my eyes to what the future holds for me in other rooms.